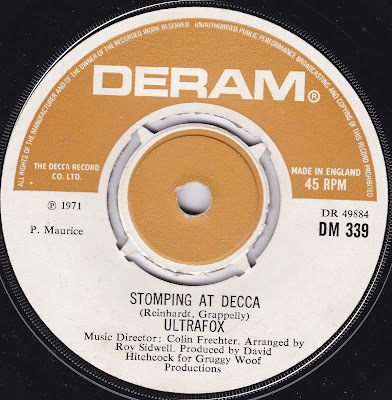 When Deram first started up, it seemed like Decca's default subsidiary label for anything slightly underground, progressive, or folk orientated. This reputation has only been bolstered over the years by the "Deram Dayze" compilation, which features psychedelic pop meanderings from across the label's late sixties catalogue. Deram never was solely a hairy, beardy sort of label, though, and also issued easy listening and novelty numbers such as the immortal, unforgettable Whistling Jack Smith's output. And then, in 1971, this "for Gruggy Woof Productions" (apparently) which is essentially a note-for-note cover of the John Dummer Band's violin led "Nine By Nine" piece from the previous year. 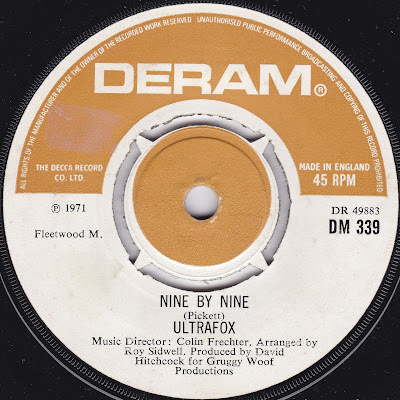 "Nine By Nine" had been very popular in some other European countries, even reaching number one in France, but had failed to chart in the UK, instead selling slowly and steadily (second hand copies for around the £3-4 mark are still a relatively common sight). Its an eccentric song, sounding as if it belongs on an old shellac 78, or as backing music on an episode of "Jeeves and Wooster". It's not clear why this cover version was necessary, but Philips failing to properly anticipate an upsurge in demand for the original version was probably partly to blame. Whatever, they caught on eventually and re-released the original, but no version of this ever charted in the UK - not Ultrafox's, nor John Dummer's. And as for who Ultrafox were, your guess is as good as mine. And my guess would probably be "a group created for a one day studio booking solely with the task of recording this quickie cover, then never heard from again".